Since 1947, Music Under the Stars has welcomed families to Capitol Hill for free evening concerts. 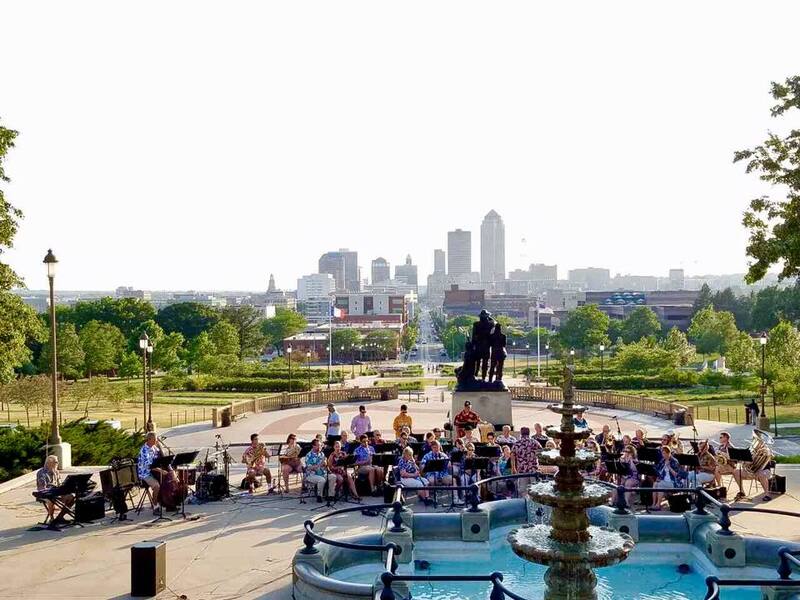 For 72 years, central Iowans have packed their lawn chairs, blankets, and picnic baskets, gathered friends and family, and come to the Iowa State Capitol to enjoy memorable performances of band music. Concerts feature a diverse variety of standard and contemporary works by premier composers performed by Iowa's own professional musicians. The musicians are those you hear at a Civic Center Broadway show or at the Des Moines Symphony, and they come together each season to perform free programs that appeal to all ages. All concerts are held at the Iowa State Capitol. The rain location is Drake University's Fine Arts Center located at 25th Street and Carpenter Avenue in Des Moines. Concerts begin at 7:00 PM. Your support matters! Music Under the Stars can provide free, high-quality music because of generous tax-deductible donations from sponsors and fans. Thank you!